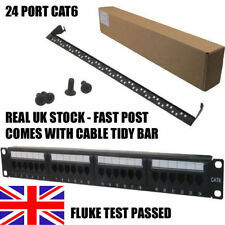 24 Way Port also compatable with CAT5E & CAT6 & Cat6E RJ45 Patch Panel 19” 1U Network Rack. Our 24 port CAT6 Patch Panel range is designed to allow patching of voice, ISDN and high-speed datasignals within Cat5e structured cabling systems. Cat 5e connections are backwardly compatible with Cat 5. 24 Cat5e Ports. 19 1u Rack Mountable. 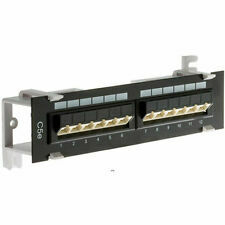 Asute CAT6A SHIELDED Through Coupler Patch Panel with Back Bar. 24 Way Cat5e UTP Patch Panel. Height U: 1u. Conforms To: ANSI/TIA-568-C Enhanced Cat5e Specification. •Suitable for gigabit Ethernet applications. Get In Touch. IDC Blocks: 4 Way Industry Standard IDC Blocks. 48 Port 2U Excel Category 6 Unscreened Twisted Pair Patch Panel. 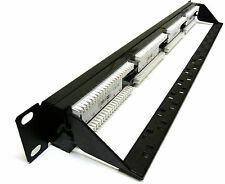 Excel 48 Port Cat6 Patch Panel - 2u UTP. Specification Cat6. Performance Overview Excel Category 6 patch panels are manufactured to provide Category 6 channel performance. 24-Port UTP category 5e patch panel. ISO/IEC11801 and EN50173 category 5e compliant. Data Storage. Security & CCTV. Need Assistance?. Colour coded 568-A/B rear Krone IDC: 22-26 solid AWG. Colour: Black. 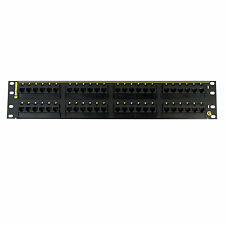 Philex 2U 19" 36 Port Patch Panel. CAT5E RJ45 with IDC Connections. 110/Krone IDC. UTP CAT5e compliant. Port Colour Code System for zone identification. Colour coded wiring diagram. 100Mhz classification (Cat 5E) 4 pair cable. 19” 1u Rack mountable. Keystone Jack in-line couplers. Cat6 patch panel. 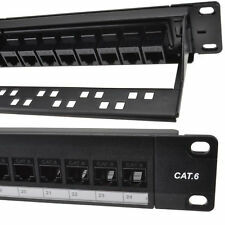 UT-899224THRU is a 1u 24 port rack mountable Cat5e patch panel. 19” 1u Rack mountable. 24 Cat5e Unshielded ports. Keystone Jack in-line couplers. End 1: RJ45 Socket x 24. End 2: RJ45 Socket x 24. Colour: Black. AKORD Nylon Double Dog Pet Lead Leash with Clip For Standard Clip Lead, Red. AKORD 7 m Pro HDMI v1.4a HD High Speed 4K 2160p 3D Lead Cable - Black. Akord Gold Plated Digital Audio Optical Splitter 1 in 2 Out Adapter Cable (White). I have fully labelled series of panels for sale for patching from no.1 to 144. If you order multiple qty I will send you these all numbered in sequence like in the photos. If you only order 1 you will receive the panel with its default screen printed numbers 1-24. This LMS Data PPAN-48-LC 48-Port CAT5e Patch Panel is your ideal patching solution for installers, integrators and data managers. LMS Data Cat5e Network RJ45 Patch Panel 48 Port 1U 19". 48 RJ45 Ports for CAT5e Ethernet Cables. 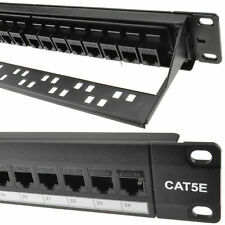 Category cat 5 E 48 Port Patch Panel Black. Wiring A/B universal. High Quality Unloaded Blank Keystone Patch Panel 24 Port Cat6a, Cat6, Cat5e etc. Earth cable included. Easy Rear Installation or Removal. Mount up to 24 Jacks in chassis. We will reply to you within 24 hours. 16 Port Patch Panel Rack Mountable Cat5e Cat5 RJ45 Hub Network 10/100 Suit 19"
16 Port CAT5E Patch Panel. • All versions can be mounted in 19” Racks. • Support T568 A&B wiring & Easy installation. Molex Powercat 6. 2u 19" Rack Mountable. 48 Port Patch Panel. The rear of the panel has an easy to follow colour code for each numbered cable position and two cable tie positions are provided for each 6 way block. All Connectix Category 6 high density panels are fully compliant with the TIA/EIA Category 6 standard. White Faceplate. White Brush. Inc 2 Fixing Screws. Excel Category 5e Screened Patch Panels comply with the current standards for enhanced Category 5. Cage nuts and mini cable ties included. Supports Gigabit Ethernet. Excel Cat6 24port Patch Panel. Condition is New. Dispatched with Royal Mail 1st Class. Excel 24 Port Patch Panel. Condition is Used. Dispatched with Royal Mail 1st Class. Rack mount blanking plate suitable for use where you would like to tidy up the front of the server rack. 19" Rack mount blanking plate. 1u in size. Colour: Black. High quality black finish Contents. I have found this in loft, never been used. 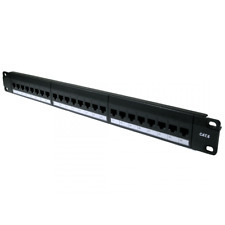 EXCEL - 100-726 - C5E 1U 24 PORT UPT PATCH PANEL BLACK. Excel Category 5e Patch Panels comply with the current standards for enhanced Category 5. They are perfect for making your own custom patch panels with Keystone modules. Category 5 Patch Panels. Front Cable Manager. 1U Brush Strip Panel, used in cabinets where patchleads at the front need. reduce front to back air flow. Get In Touch. Product Title. Get Social. Panduit NetKey 48 Port Cat5e RJ45 Network Patch Panel. Condition is Used. Dispatched with Royal Mail 1st Class.